How do you compare to Olympic swimmer Michael Phelps? He of five Olympics, 28 total medals, 23 gold medals, and three world records? Simply, what do you and Phelps have in common? 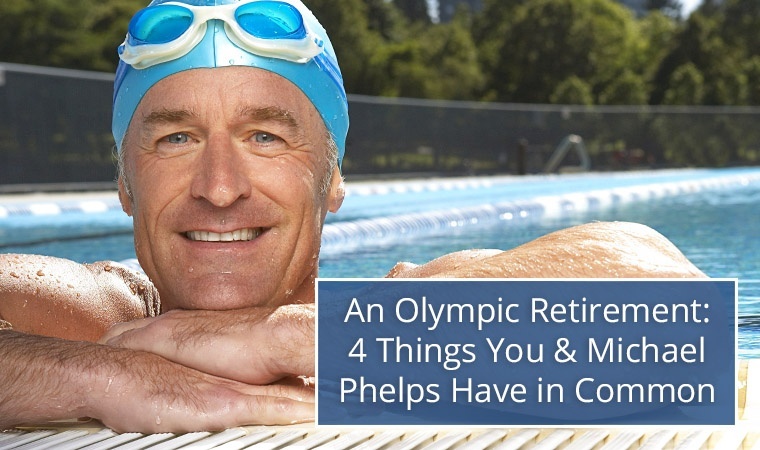 With the announcement that the world’s greatest swimmer is hanging up his Speedo, it got me to thinking: What are some of the things that you’d find at the intersection of Michael Phelps and your dream retirement? If an Olympic-level retirement is in your future, you know that your pursuit of that goal didn’t begin yesterday. It takes a combination of professional advice, consistent saving, and hard work to achieve retirement greatness. While he’s an otherworldly swimmer, Michael Phelps has not had a perfect life. His parents divorced when he was quite young. In fact, his mother got him into swimming to help him deal with his anger in a constructive way. As an advisor, we’ve seen plenty of adversity in the markets over the past 20 years. Volatile markets have forced thousands of people to delay their retirements—sometimes for many years—all in the hope that they can recover what they’ve lost during a sudden downturn. The fact is that one bad market day could ruin your transition into retirement. But a well-diversified portfolio can help you overcome adversity in the markets. One of the best ways to assess the risk in your portfolio is to have it stress tested against historical market conditions. Don’t wait for stocks to hit a rough patch to find out your 401(k) was full of hidden risk. For more information on ways to protect yourself from market volatility, learn how a Portfolio Stress Test could be of benefit to you. Michael Phelps not only has a support staff of coaches and trainers, along with a nutritionist and a masseuse, but who do you think drove him to all those 4:00 AM practices when he was a kid? Yes, it takes a team. But it also takes the right team. Phelps credits his mother, along with legendary swim coach Bob Bowman (who began training him when he was 10), for his success. Michael Phelps’ first job after retiring from competition will be as a swim coach at Arizona State University. Phelps’ estimated worth is $50 million, so he doesn’t really have to do anything. Instead, however, he’s choosing to work because that’s what he believes will make him the happiest. Increasingly, I’ve seen the retirement of Baby Boomers become more focused on quality of life concerns such as personal growth, education, entrepreneurialism, and rich or varied experiences such as adventure travel. Partnering with an advisor to make your money work for you is a good way to help you achieve the freedom to live the retirement of your choosing. You may work, you may volunteer, or you might go back to school. The important thing to remember is that if you plan well, what you do will be your choice. Just like Michael Phelps, day after day you’ve worked hard, all in the hope that you would achieve a goal of a satisfying future. As with training for the Olympics, the retirement transition process evolves as laws, taxes and society changes. Has your preparation changed? Have you evolved? Are you getting the most up-to-date advice and guidance? If you’d like more information on the retirement transition process, talk to an advisor today.